Since the launch of the Raw Materials Initiative back in 2009, the European Commission has stepped up efforts to ensure a secure and sustainable supply. The EU still imports 80 per cent of its demand for critical raw materials (CRMs) however. A considerable share originates in China, raising concern about an impending strategic dependence as industrial competition gains momentum. The European Commission’s communication “Investing in a smart, innovative and sustainable industry: A renewed EU Industrial Policy Strategy”, points to two major industry trends: digitalization and decarbonisation. Against this backdrop, and in line with commitments undertaken in the Paris Agreement, CRMs are poised to be of strategic importance for the European industrial system in order to ensure a successful and cost-effective transition to a zero carbon economy. Critical raw materials are defined as commodities having a considerable impact on the EU economy as well as a high risk of supply shortage. Among these, photovoltaic (PV) thin cells, wind turbine generators and lithium-ion batteries are among the most relevant green tech applications of CRMs. Key components and raw materials, such as gallium and indium are instrumental in the PV panel value chains, while neodymium (classified as LREEs) and dysprosium (classified as HREEs) are needed to produce permanent magnets used in generators for offshore wind energy. Neodymium is also used in electric vehicles together with cobalt and natural graphite. In 2011, the European Commission published its first list of CRMs, with a commitment to update it every three years. The list is an important tool to assess European supply needs and thus provide factual analysis to support better investments and industrial strategies. The updated 2017 version identified 43 individual CRMs (assessed according to the mining/extraction stage or the processing/refining stage), with 9 new entries compared to 2014. The study employed two main parameters to determine the criticality of these materials: supply risk (SR) and economic importance (EI). 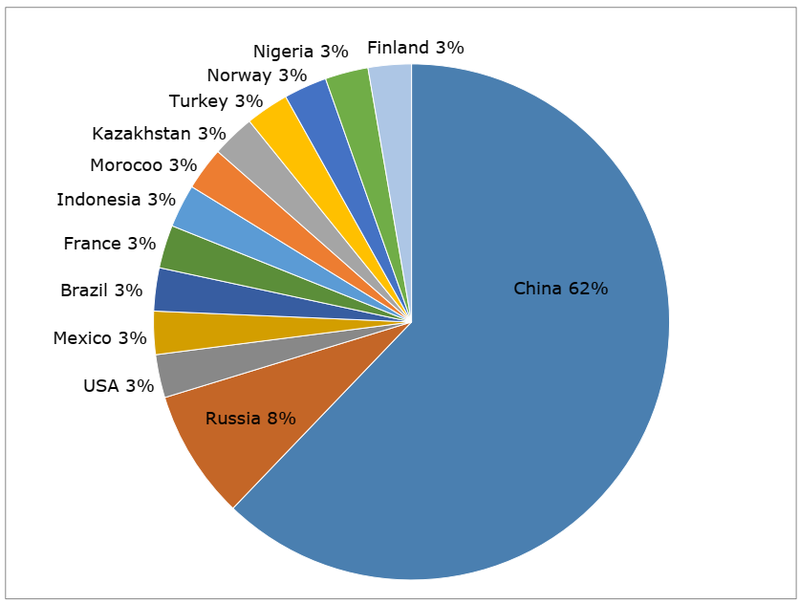 Significantly, the 2017 list demonstrates that China is the largest global supplier of 30 out of 43 individual CRMs (see Table 1). Source: Deloitte Sustainability et al., Study on the Review of the List of Critical Raw Materials, cit., p. 10. Note: Stage refers to the life-cycle stage of the material that the criticality assessment was carried out on: extraction (E) or processing (P). 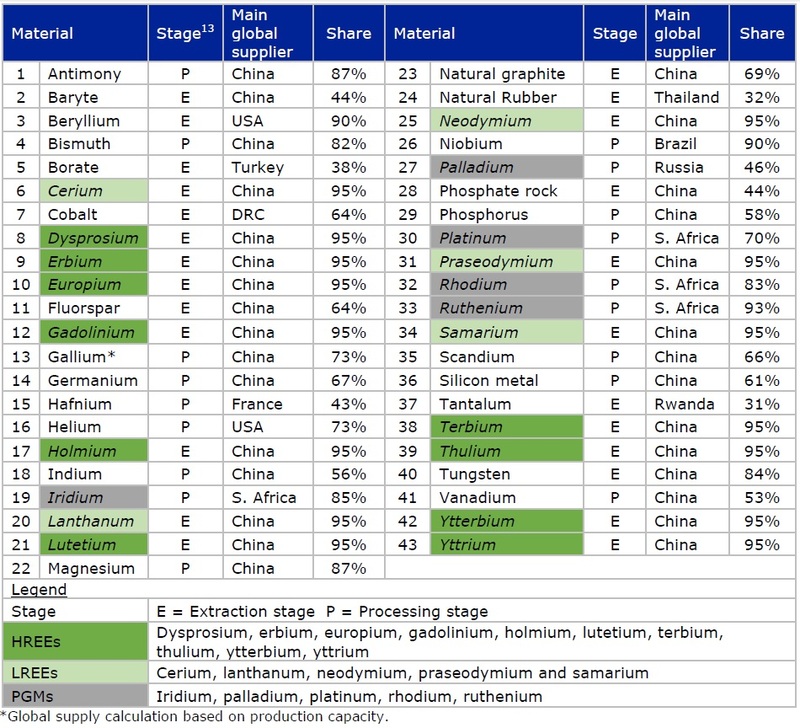 With regards to EU demand, and notwithstanding the fact that a multitude of countries retain a significant aggregate portion of the supply, China still holds the lion’s share of these materials (see Figure 1). For instance, the EU’s import reliance for neodymium and dysprosium is 100 per cent, with China accounting for 95 per cent of world production. The bulk of EU domestic production of CRMs takes place in France (hafnium), Germany (gallium), Norway (silicon metal) and Finland (cobalt). Source: Deloitte Sustainability et al., Study on the Review of the List of Critical Raw Materials, cit., p. 16. The People’s Republic of China (PRC) is also the major consumer of several CRMs and is further directing investments in technology-intensive manufacturing, such as lithium-ion battery production for electric vehicles. China’s battery manufacturers, supported through government subsidies on electric vehicles, are catching up with South Korean and Japanese competitors. The current battery production capacity of CATL – China’s national battery champion – stands at 7.6 GWh, with an estimated growth that will see it overtake Tesla’s gigafactory by 2020. China’s approach resembles the strategy adopted with solar energy: drive costs down to dominate the industry. Indeed, a sustained increase in production over time would induce a downward spiral of battery prices, creating some difficulties for European companies. The 2008 adoption of the European Commission’s communication “The raw materials initiative” marked a turning point in European policy debates on the issue of a sustainable supply of CRMs. Aside from the CRMs list in 2011, the European Commission has promoted several other initiatives in this domain. In 2013, EU governments, industry representatives, academia and NGOs jointly cooperated in the design of a comprehensive strategy to set targets and prioritize actions to be implemented by 2020. The Strategic Implementation Plan (SIP) covers 95 actions, ranging from research and development (R&D) to technology innovation to substitute raw materials, including efforts to improve Europe’s waste management. To facilitate data collection and the establishment of a coordination framework among EU stakeholders, the European Rare Earths Competency Network (ERECON) was established in 2014. Its objectives are to outline opportunities and challenges for the primary supply of rare earth elements (REEs) along with tentative policy recommendations for a sustainable and diversified European REE supply. In 2015, ERECON delivered its report on rare earth elements, which demonstrated that European REEs mining has potential, especially in Sweden and Greenland, albeit funding and environmental permits remain a challenge. With regards to the circular economy – a regenerative system aimed at minimizing the energy and resource impact over the whole life cycle of a product – the Commission’s communication “Closing the loop: An EU action plan for the circular economy” contains an entire section on critical raw materials, with recommended actions to encourage end-life recycling as well as landfills and mining waste recovery. The EU’s initiatives have raised awareness on the issue of CRMs, advanced policy recommendations in the domain of resource efficiency and waste management and provided a framework for cooperation and exchange of data among stakeholders. Nonetheless, supply risk and direct access to CRMs remains a significant pitfall of the European strategy. In 2010, China raised export quotas on rare earth elements, resulting in prices hikes and concern in the European and US industry community. Although China lost the World Trade Organization dispute filed by the US following the rare earth export quotas implementation, growing domestic CRMs demand in the face of “Made in China 2025” targets combined with Beijing’s ambitions to squeeze out industry competitors may jeopardize EU supply. China has already tightened market access to non-Chinese battery producers while calling for domestic enterprises to invest abroad. CATL entered into an agreement with Volkswagen and the National Electric Vehicle Sweden to provide batteries. China Molybdenum secured cobalt supply for decades in one of the world’s largest mines in a 2.65 billion dollar deal with the Democratic Republic of Congo signed in 2016. The EU has focussed primarily on long-term strategies, namely resource efficiency, R&D investments and potential EU mining development. These are capital-intensive initiatives and will take time, and thus are not sufficient for European industries to compete with China. Access to CRMs is not the only issue at stake. Ultimately, the crucial battleground in the battery arms race is expected to be in the domain of research and innovation (R&I), inasmuch as technological breakthroughs in higher battery density will be the game changer. The EU should adopt concrete actions to enhance trade and political relationships with third country producers of CRMs in order to mitigate supply risks. Moreover, there is a need to promote industrial cooperation initiatives between the two shores of the Atlantic and better coordination among the “national champions” of individual member states in an effort to lock-in and develop key R&I advantages. Should the EU fail to address supply reliance on China and promote R&I investments in key sectors, the net result is likely to be overdependence on foreign technology. Implications are gloomy, as trends in the lithium-ion battery market are showing. Volkswagen and Daimler have respectively signed agreements with South Korea’s LG Chem’s Polish factory and China’s CATL for battery supply. Worse still, as of June 2018, Europe has only one battery cells factory for EVs, operating in the UK to supply Nissan, while Samsung SDI is planning to open a battery factory near Budapest. Looking to the future, it is high time that Europe direct effort and resources to develop sustainable alternatives needed to keep strategic industries strong and independent. The capabilities and potential are there, and having succeeded to raise awareness about CRMs and their key importance for the future, European member states should move towards greater EU-wide cooperation and planning in an effort to preserve and build upon existing European expertise in the industry. * Francesco Paron is a MA student in International Relations at the University of Bologna and a former intern at the Istituto Affari Internazionali (IAI). European Commission, Investing in a Smart, Innovative and Sustainable Industry. A Renewed EU Industrial Policy Strategy (COM/2017/479), 13 September 2017, para. 1, https://eur-lex.europa.eu/legal-content/en/TXT/?uri=celex:52017DC0479. Wiebke Rabe, Genia Kostka and Karen Smith Stegen, “China’s Supply of Critical Raw Materials: Risks for Europe’s Solar and Wind Industries?”, in Energy Policy, Vol. 101 (February 2017), p. 693. Deloitte Sustainability et al., Study on the Review of the List of Critical Raw Materials. Criticality Assessments, Luxembourg, Publications Office of the European Union, June 2017, p. 26, https://doi.org/10.2873/876644. The figure should not be interpreted in terms of tonnage of CRM that originate from these countries, but in terms of the number of CRMs, for which the country is the main global supplier or producer of the CRM. Henry Sanderson, Tom Hancock and Leo Lewis, “Electric Cars: China’s Battle for the Battery Market”, in The Financial Times, 5 March 2017. European Commission, The Raw Materials Initiative: Meeting Our Critical Needs for Growth and Jobs in Europe (COM/2008/699), 4 November 2008, https://eur-lex.europa.eu/legal-content/en/TXT/?uri=celex:52008DC0699. European Commission, Strategic Implementation Plan for the European Innovation Partnership on Raw Materials. Part II: Priority Areas, Action Areas and Actions, 18 September 2013, https://ec.europa.eu/growth/tools-databases/eip-raw-materials/en/node/34. ERECON, Strengthening the European Rare Earths Supply Chain: Challenges and Policy Options, June 2015, http://ec.europa.eu/growth/sectors/raw-materials/specific-interest/erecon_en. European Commission, Closing the loop - An EU action plan for the Circular Economy (COM/2015/614), 2 December 2015, para. 5.3, https://eur-lex.europa.eu/legal-content/en/TXT/?uri=celex:52015DC0614. Tom Miles and Krista Hughes, “China Loses Trade Dispute Over Rare Earth Exports”, in Reuters, 26 March 2014, http://reut.rs/1llVCbc. Yilei Sun and Andreas Cremer, “Exclusive: China’s Lishen Plans First European Sales Office for Electric Vehicle Batteries - Source”, in Reuters, 23 April 2018, https://reut.rs/2qQrbBG. Henry Sanderson, Tom Hancock and Leo Lewis, “Electric Cars: China’s Battle for the Battery Market”, cit. Federico Mascolo, “The Rise of Lithium Batteries: A New Form of Energy Dependence?”, in IAI Commentaries, No. 18|14 (March 2018), http://www.iai.it/en/node/8840. Eric Onstad, Christoph Steitz and Esha Vaish, “Europe Up Against Asian Juggernaut in Electric Car Battery Drive”, in Reuters, 5 June 2018, https://reut.rs/2kN5S0l. “Factbox: Plans for Electric Car Battery Production in Europe”, in Reuters, 5 June 2018, https://reut.rs/2xJW3d4.